Towering above the player, the race of giants is scattered throughout Lordran. Three giants can be found in Sen's Fortress, each with a different role: gatekeeper, boulder thrower, and firebomb thrower. 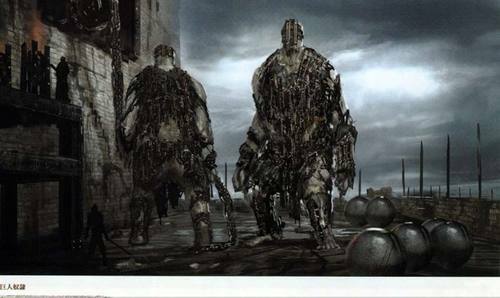 In Anor Londo, an army of giants stand guard as sentinels, ready to protect the sacred city if provoked. There is also a friendly giant Blacksmith in the city. There are also giant skeletons that roam the graveyards and dark areas of Lordran. They are very strong and present a major threat in narrow places like The Catacombs and the Tomb of Giants. One of these giants guards the Darkmoon Seance Ring. but due to its giant size, it is extremely heavy for humans, and impedes stamina recovery. Large halberd made of old brass, used by the giant sentinels of Anor Londo. but as the halberd is designed for the giant sentinels, its weight is unbearable. Greatshield made of bronze and marcasite. Used by Giant Sentinels of Anor Londo. but as the shield is designed for the giant sentinels, its weight is unbearable. Wooden hammer of the giant blacksmith in Anor Londo who handles lightning weapons. as it would be hazardous to handle lightning weapons with metals.